+$Japanese designer Oki Sato shares his advice on how to live as a creative. +$Tokyo-based designer Oki Sato is a self-confessed design addict who works on hundreds of projects at any given time. 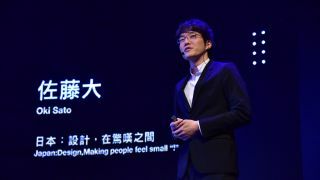 The popular creative and chief designer at+$nendo+$studio rarely makes public appearances, but ahead of his next scheduled appearance at the opening ceremony for the Tokyo 2020 Olympic games, he took the time to speak at the+$Golden Pin Design Awards+$at the start of the month. +$Billed as the lead speaker, this was a unique opportunity to see a talk from the reclusive Oki Sato. "As I human I might not function that well," he confesses, "but I'm an excellent designer." +$Throughout the course of his presentation, Oki Sato shared anecdotes and wisdom gleaned from decades of working as a designer. Having accomplished so much over the years, this talk was a valuable insight into the mind of a formidable creative talent. For those that couldn't make the event, we've rounded up three important ideas we took away from the presentation which are sure to inspire creatives into honing their design outlook. +$When it comes to talking about design, Oki Sato's first step is to clarify what design means to him. "Design can be just a minor change in life," he explains. "Some minor tweak, to come up with a new form, a new kind of representation." +$With this in mind, Oki Sato reflects on his time as a design student. While studying, he reveals that he was taught to think about design within a context, such as a building like a house. This top down approach provided a focus for him to hone in on. +$"When I became a designer, in my daily life as a designer, I discovered that we have to start small, maybe start from a glass, then the table, then the furniture in the room, then the room, then the building, then the city, etc," he says. +$By being aware of his creative context, some of the design choices were already made for Oki Sato. These choices in turn influenced other areas of a project and eliminated a lot of mental distractions, allowing him to concentrate on design practicalities. +$As well as being aware of the landscape you're designing in, Oki Sato also advises that creatives should stand back a bit and look at their work "with a time lag." +$By giving their work some distance this allows designers to get a sense of perspective, which in turn generates unusual ideas, and if you're lucky, design solutions. +$"If we want to find the creative ideas, it helps to think like an air purifier," he says. "A lot of ideas flow through our daily lives, we're very at ease with this in our environment. The air purifier captures the dirt, the dust, which in this case are ideas. So in our natural life, very spontaneously, we can find these ideas." +$So by keeping a broad mind, designers can stumble upon new ways of interpreting their work in the world around them. This doesn't mean, though, that designers have to lead radically unusual lives to find these ideas. In fact, Oki Sato argues that the more boring the better. +$Like a lot of influential creatives, Oki Sato treasures a routine. Every day he dresses in the same clothes in a similar fashion to Facebook's Mark Zuckerberg - although Oki Sato favours sharp suits over jeans and a t shirt. +$"You could say it's boring, everyday I do the same thing - walk dogs, visit a cafe, eat noodles for lunch," he says. "But I’m able to spot details in my daily surroundings, and this is because I follow this daily routine. Because I'm repeating the same activity, I won’t be tired. I want to make sure in my daily life that I can devote my energy to design." +$By living in a series of regular events, anomalies jump out a mile. Oki Sato calls these small "!" moments. “Design might be fancy, it might be glamorous, you might make a lot of sound and fury with design, but design can also be small, very subtle,” he argues.